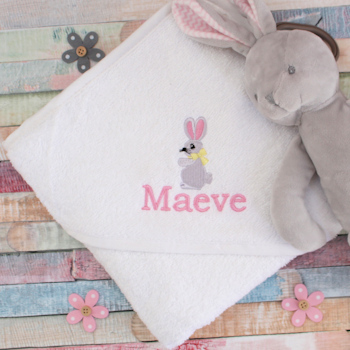 White hooded baby towel cuddle robe featuring exclusive embroidered bunny rabbit design and you can choose to have made special with babies name personalised with embroidery. White hooded baby towel cuddle robe featuring exclusive embroidered bunny rabbit design and you can choose to have made special with babies name personalised with embroidery. Quality soft cuddle robe made from 100% absorbant cotton measuring 75cm by 75cm to keep baby snuggly warm after bath time.